It is always nice to hear from people who have bought my orgonite creations how their lives improved, or how they were helped. I have written before how some of my clients electrosensitivity greatly improved. You can find my previous blogs by typing Orgonite in the Search box of this page. If you want to know more about orgonite click on the orgonite tab in the above menu bar. “My sons were having awful nightmares every week for the last couple of years. Since they put an orgonite disk under their pillow, they have not had any nightmares anymore. They are sleeping peacefully now. They won’t go to bed without the disks under their pillow! I love the pyramid you sent last week, its lovely, and also the two smaller discs are much appreciated. With one disc under my pillow, I’ve been going to sleep quickly rather than tossing and turning for an hour or so every night!. Thanks so much for making these pieces. Whenever I have difficulty sleeping, I grab an orgonite piece containing shavings (aluminum or bronze), which helps me relax and fall asleep. I have seen so many orgonite pieces for sale on the internet, but they seem to be more about “pretty colors and designs” rather than effectiveness. I have no doubt that you make powerful pieces. My house and office are calmer as a result! Thanks! This stuff is great. I really appreciate it. It feels like music sounds better, people are reacting to me differently, I am sleeping better and that is all after two days. I need more of this stuff. Thanks again Dirk. “Dirk, I have really appreciated the orgonite that I purchased. I wear the pendant every day, keep the pyramid in my bedroom, and sleep with the disk under my pillow. The bad dreams that I was having stopped completely and I am sleeping much better (all of the smart meters for this apartment complex are not far from my bedroom). Also, when I first put the pendant on I experienced a “draining” effect of negative energy out of my head that I can only describe as being sort of like having your sinuses clear after being blocked for a long time. I don’t understand how the orgonite works….but it does, and these are only a couple of the benefits I have experienced. It has been some time since I purchased from you the two large cones, but I want you to know how they have changed the atmosphere in our house. You can read more feedback by going directly to my Customers Experiences page. 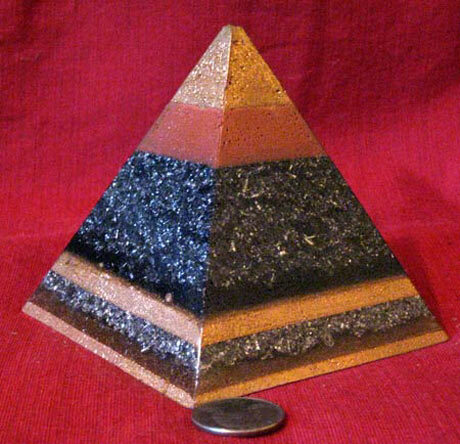 To look at my orgonite creations go to my Orgonite For Sale page. This entry was posted in healing, orgonite and tagged healing, orgonite, problems, sleeping. Bookmark the permalink.